We work slowly. We routinely cover stuff that was released in prior years. We have things we’d like to review that came out this year, but haven’t gotten to them. We don’t feel obliged to rush just because it’s December. We’re obstinate curmudgeons. Why would we think anyone would be interested in what we think anyway? You can read what we’ve written so far. You should be able to determine our likes and dislikes. We’re fickle. We like things at the time we discuss them. Several months later and especially at the end of the year, we may have already forgotten about things which once excited us. How we feel in December may no longer represent what we thought in January. We resist consumer impulses. All those other lists seem like sales guides. We don’t make any money with our reviews. We don’t want readers to presume there’s any quid pro quo behind the scenes. A list would be redundant. We try to write about what we like, so if we covered it positively during the year already, then that would be our list. Lists generally infuriate us. Glancing at others’ Top-Ten lists, we see things we just hated or whose existence completely baffles us. We think some others’ lists are simply marketing efforts or ways to show allegiance to the club of the fashionable. Sure we like to peek at others’ lists, but usually they make us question the sanity and honesty of the list maker. 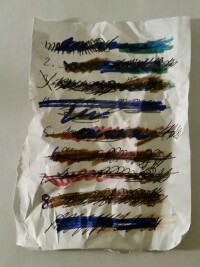 Lists suggest finality. We already said we’re fickle. If we created a list, we’d probably keep changing it, adding to it, taking things away, and reordering it. We’d feel bad about it as soon as we posted it, because we know we’d forget something we really liked at the time. We’re terrible with deadlines. To get an end-of-year list ready for December, we would have had to start in July. That would really defeat the point.